Ranking points will decide which teams receive the wild cards - three Dutch Premier League events per gender have been selected to count towards the final wild card ranking. The first men's qualification event took place in Arnhem last weekend. Marco Daalmeijer and Kees Spil won by beating Daan Spijkers and Tim Oude-Elferink in the final 2-0 (23-21, 22-20). 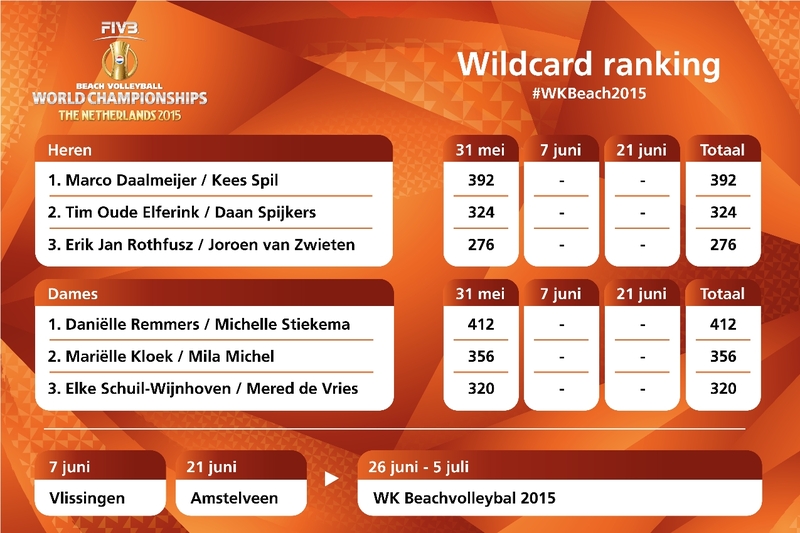 With two events to go, Daalmeijer and Spil lead the men's wild card ranking. In Budel, Daniëlle Remmers and Michelle Stiekema obtained important points towards winning the World Championships women's wild card by winning their final against Mariëlle Kloek and Mila Michel. For both men and women, the qualification race continues next week in Vlissingen (June 6-7) and will be decided two weeks later in Amstelveen (June 20-21).